There are few filmmakers out there quite so adept at blending fantasy and reality as Hong Sangsoo. There's an almost otherworldly quality to his films - always grounded in reality but always making the audience question what is real and what isn't. He manipulates perception and time in such subtle ways that we often don't realize he's doing it until after the fact. Such a skilled craftsman is he that the seams are always invisible, and the results often breathtaking. A little background is needed to truly appreciate the deft hat trick that Hong pulls in his latest film, On the Beach at Night Alone. In 2015, the 55-year-old Hong left his wife of 30 years for 34-year-old actress, Kim Min-hee, the star of his 2016 film, Right Now, Wrong Then. It was a film about a director who falls in love with a younger woman; and life, as they say, imitated art. It was a major scandal in Hong's home country of South Korea, and was covered extensively by the Korean tabloids. In On the Beach at Night Alone, he reunites with Kim Min-hee to grapple with the fallout from their affair. Kim stars as Younghee, an actress who has just returned to Korea from abroad after a torrid affair with a married filmmaker. Trying to put her life back together, she stays with friends until she's back on her feet. However, as alcohol flows at dinner parties with friends, confessions begin to spring forth, culminating in a confrontation with the very filmmaker with whom she had the affair. As the truth comes out, Younghee finds herself questioning everything, and at last coming to terms with the romance that forever changed the course of her life. Whether On the Beach at Night Alone is art imitating life or life imitating art is hard to say. That's part of what makes Hong's work so extraordinary. It's part confessional, part self-assessment, part fiction - and who's to say where one diverges from the other? It's a kind of meta-cinematic fantasia through which Hong, and by extension, Kim, exorcise their own demons through their art. When Younghee finally unleashes on the director at the end of the film (a powerful scene which helped propel Kim to the Silver Bear for Best Actress at the Berlin Film Festival), is that Kim unloading her feelings on Hong? Or is that Hong punishing himself for his own sins? The truth, of course, lies in all possible scenarios. Hong's films are beautiful enigmas that seemingly exist in a mysterious place where cinema meets the real world, where one often cannot tell which is which. 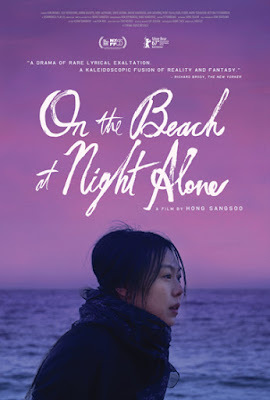 On the Beach at Night Alone is a fascinating and deeply cathartic work, in which a filmmaker openly grapples with his own inner conflict and guilt. It is rare to see a filmmaker open up to his audience in such a raw and honest way, confronting himself as much as the public that crucified him for falling in love. But perhaps the most remarkable thing about it is that Hong doesn't just make this about himself. This is Kim's story as much as it is his, and he allows her to speak through her wrenching and emotionally vulnerable performance. To watch On the Beach at Night Alone is to bear witness to the souls of two artists being laid bare. It is both defiant and confessional, simultaneously seeking justification and absolution. Unlike Hong's 2000 film, Virgin Stripped Bare by Her Bachelors, this is Hong stripped bare by himself, and the results are a singular and poignant act of self-examination and personal catharsis that takes private pain and turns it into an anguished public atonement. ON THE BEACH AT NIGHT ALONE | Directed by Hong Sangsoo | Stars Kim Min-hee, Jung Jae-young, Seo Young-hwa, Kwon Hae-hyo, Song Seon-mi, Moon Sung-keun, Ahn Jae-hong | Not Rated | In Korean w/English subtitles | Opens Friday, Nov. 17, in NYC.